Flavour combinations made in heaven include: tomato and basil, peanut butter and chocolate, salt and caramel. And pear and blue cheese. 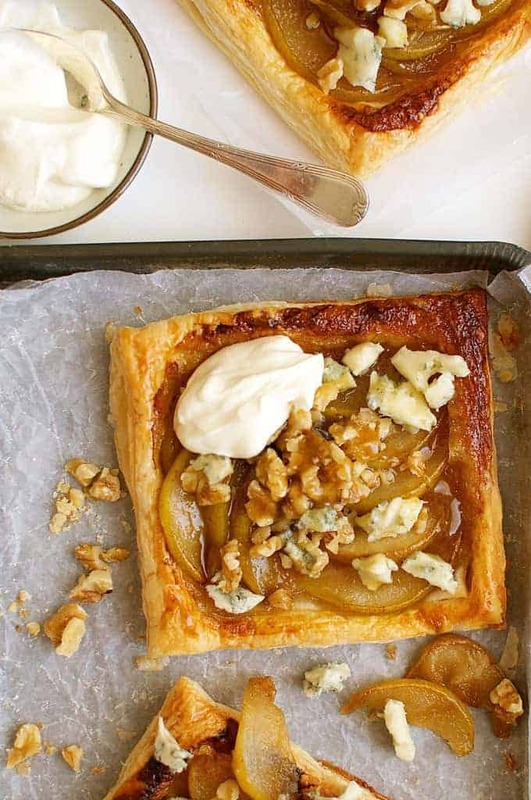 Here this magic duo star as the topping on a quick puff pastry Pear and Blue Cheese Tart. If you haven’t tried blue cheese with pears before, you are really depriving yourself and I strongly urge you to rectify that immediately. Get a slice of toast, top with thinly sliced pears, some blue cheese, a drizzle of honey and some crushed nuts (walnuts goes especially well). Take a bite and be prepared to make that noise that’s all too familiar when your mouth is stuffed full with something that is truly divine….nom nom nom…. What is it about that combination of flavours?? The salty, creamy, strong blue cheese. The sweet juiciness from the pear with added sweetness from a drizzle of honey. And the finishing touch – the crunch of some nuts. It is seriously divine. Divine, divine, divine x 10 million. Throwing 4 ingredients on a piece of toast will make a dent in your craving. Or if it’s your first time trying that flavour combo, it will certainly convert you for life. But if you really want to go aaaaalllll the way, you’ve gotta try these tarts! It’s not often that I find myself stuck for words. But honestly, as I munched through these (using my hands – knife and fork required too much patience), my mind actually went blank and I just savoured the incredible flavours. Making the effort to caramelise the pears makes a world of difference as it softens them plus creates a syrup which is flavoured with the pear juices. Then you simply pile it onto puff pastry and bake until puffed and golden. Crumble over blue cheese and a scattering of walnuts (which I toss in the oven for the last 5 minutes when baking the tarts). If you are really inclined, serve it with a dollop of thick greek yoghurt on the side. The yoghurt adds an element of freshness to cut through the richness of the tart, but I am really in two minds whether it’s needed or not. I like it equally with and without. Quiche Lorraine – and Hash Brown Crust Quiche Lorraine! The flavour combination of these tarts is truly a match made in heaven. 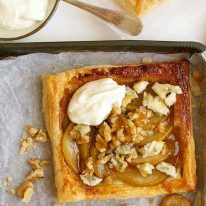 Sweet, soft pears with creamy, salty blue cheese, piled on flaky puff pastry and scattered with crunchy walnuts. I served these with a dollop of creamy, thick yoghurt on the side which I thought cuts through the richness a bit. But I can't decide whether I like these better with or without the yoghurt - you choose! Preheat oven to 180C/350F and line baking tray with parchment/baking paper. Cut the puff pastry into 4 equal squares (Note 1) and transfer to baking tray. Cut each pear into quarters, remove the core and cut each quarter into 3 or 4 slices. Place the pear, butter, sugar and salt in a small fry pan or saucepan over medium high heat. Cook for 5 minutes, stirring occasionally, until the pear is softened and the pear juice has mixed in with the butter and sugar to form a syrup. Pile the pear mixture onto each piece of pastry, staying within the border. Drizzle with some of the syrup. Bake for 20 to 25 minutes, until deep golden brown. Toss the walnuts onto the baking tray for the last 5 minutes of baking. Remove the tarts from the oven and let them cool for 5 minutes. 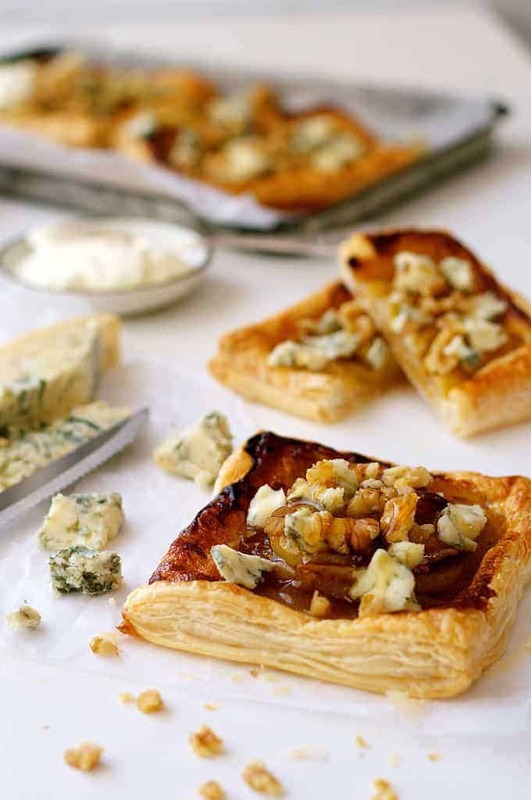 Top with crumbled blue cheese, scatter with walnuts and drizzle with remaining syrup. Serve immediately, with yoghurt on the side, if using. 1. To cut the puff pastry, press down with a large knife and bring it straight back up. Do not drag the knife through the pastry, it will make the puff pastry layers "stick" together so it won't puff up as much. 2. Use a small knife to score the border. Try to score it as deep as you can - for maximum puff - without cutting through. Don't worry if you cut through though, it should self bond when baking (I often accidentally cut all the way through!). 3. Try not to get egg wash on the outer cut edge of each piece of pastry as it acts as a binding agent so the pastry will not puff up as much. 4. This is best served immediately. If making ahead, keep the tart separate from the syrup, blue cheese and walnuts. Reheat the tart in the oven, then assemble per the recipe directions. I have some blue cheese to use up so this is coming to a party with me tomorrow! Nagi, I have been searching your blog for breakfast recipes, at my job we rotate breakfast for our weekly team meetings, and it became seriously competitive ever since I introduced them to your strawberry french toast! I’m thinking of this one for when it’s my turn again, and I have two questions: 1) would this travel well if it wasn’t eaten right away? Say like an hour? 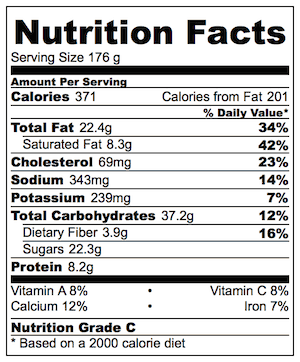 and 2) what is a good alternative to the walnuts? One of my colleagues does not like walnuts so I’d like to modify his. You BYO breakfast for meetings? That’s SO COOL! 🙂 You’ve just motivated me to do more breakfasts that travel well 🙂 Yes this travels very well! It is really good at room temperature – just like a pastry from a patisserie. I think the best substitute for the walnuts is almonds. Or even Macadamias! I would suggest pecan nuts, as a alternative for walnuts, what do you think, Nagi? Love your blog, Nagi. Several times have looked up interesting and delicious looking recipes and find I am again on “recipe Tin Eats”!! This recipe reminds me of one I saw a few years ago, demonstrated by a TV chef (sorry, I forget his name)…he cooked from a streamline motor home…one of those “cool” California ones, small, round and silver…so his recipes were easily prepared, but always innovative and sophisticated in a simple, fresh food sort of way. Anyway…he took two slices of fresh raisin bread that he found at a local market…he was always on the move and on the lookout for good local ingredients…and made a sandwich of sliced pear and blue cheese…he sprinkled on a few chopped walnuts..and closed it up. He then spread butter on OUTSIDE of sandwich and grilled it!!! He then cut it into fingers and served it with a good brandy for dessert, to his guests as they sat in lawn chairs around a bonfire. Just a different “take” on the same fabulous flavors!! Hi Jane! Thank you so much for your message! AND for sharing that incredible idea….a raison bread blue cheese pear and walnut toastie? That’s LEGENDARY!! I love cooking shows like that. It just goes to show that you don’t need a big fancy kitchen to make incredible food. Some of the best food I have ever had in my life has been in the middle of no where on long rafting trips, no kitchen, cooked over a fire with fresh fish caught from a river, or simply from canned food we’d been carrying around for weeks. Nagi, that chef was Bob Blummer, cooked out of a small air stream made to look like a toaster with two slices of bread popping out of the top. He was very creative like yourself . Not til march 2016 – a spring wedding even thought it’s generally a fall recipe! In salads, I just eat them fresh. I do like it with caramelized walnuts though! 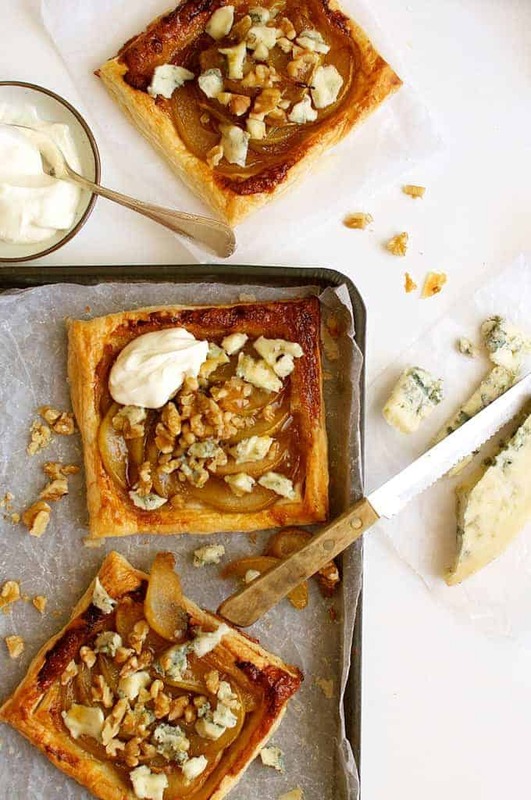 It’s so true that the flavors of pear and blue cheese are a match made in heaven! These tarts look so sophisticated too. They’d be gorgeous for a dinner party or other celebration. What a masterpiece, Nagi! I love the flavors you had described! And I’m dying to try this in my kitchen! Love it!!! I am drooling over the caramelized pears and they do sound perfect with the gorgonzola! I am such a sucker for anything with puff pastry too. Love how elegant yet simple this is to make!